" What do you mean I can&apos;t?" Draco almost yelled out. " I&apos;ve done everything for her, and I will do more if I have to. For God&apos;s sake I saved your life!" He was so upset right now and confused.
" Son, I&apos;m sorry. Of course you can have her hand in marrige. I just wanted to see what your reaction would be" Hermione&apos;s father said. Draco&apos;s heart almost stopped again. He wasn&apos;t joking now, right? " I can ask her? You&apos;re for real?" " Yes, I&apos;m sorry, I didn&apos;t mean to frightend you. I just want to make sure that you&apos;ll do anything for my daughtyer. " Draco smiled up and nodded. " I will do anything for her"
Draco took Hermione out on a restaurant later that night and told her he wanted to talk with her. But Hermione also had something to say.
" Draco, there is something I have to talk to you about..."
" Okay Mione. I need to talk to you too about something"
" Oh, well why don&apos;t you go first?" " Okay..... I don&apos;t see a reason to say this in a another way. So I will just say it" He took out a ring from his pocket and showed it to her so she could see it clearly.
" Draco what are you...?" " I&apos;m asking you to marry me, Hermione. That&apos;s what I&apos;m doing. Because without you, I&apos;m totally lost"
" Oh Draco..." Hermione said happily. " Of course I will marry you!" She flung around his neck and kissed him hard. Draco could almost feel tears growing up behind his eyelashes. He carefully placed the ring on her finger and kissed her cheek. Then he remembered that she wanted to say something too.
" By the way, Hermione. What was ut you wanted to talk about?" Hermione took a deep breath and blushed a bit.
" I know it sounds weird. But I wanted to talk to you about marrige too. Maybe not propose, but just letting you know that I would gladly get married some day. But only if you wanted me of course"
Draco chuckled and just shook his head and cupped her face with his hand.
" There&apos;s nothing more in the world I want than you"
Ginny and Blaise lived in their own departement in London and one day recived a letter from Draco&apos;s owl. Ginny got it and opened it up. When she saw the text she almost fainted. " Oh Merlin&apos;s beard! Blaise come here!" Blaise hurried out in the kitchen and looked at her with a worried look.
" What is it honey?" Ginny showed him the letter and couldn&apos;t bareley find the words to speak. " Draco and....Hermione....are getting m-married!" " That prick!" Blaise said. " And he didn&apos;t tell me anything about it? I&apos;m his best friend!" Ginny sighed and rolled her eyes.
" Ever heard of privacy, eh? Besides, you haven&apos;t even read the letter. Because Hermione wants me to be the bride of honor. While Draco want you to be the best man!" 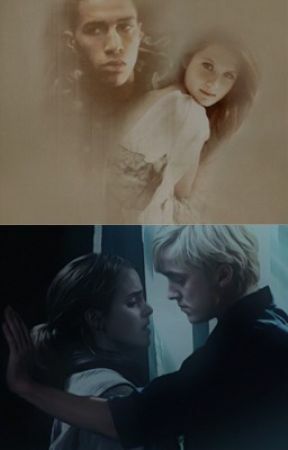 Now Blaise&apos;s face shone up and he grabbed Ginny&apos;s hand.
" Come on, we have to go shopping! Our best friends is getting married!"